Now that you’re all rested up and cheerful after Thanksgiving, here is a depressing trend piece: as you might expect given the location of the crisis, America’s auto industry finds itself increasingly dealing with the opioid epidemic—addiction to prescription painkillers and heroin that now kills more people each year than guns or car crashes. Plants responsible for more than 70 percent of the Detroit automakers’ U.S. production are in states identified by the Centers for Disease Control and Prevention as having statistically significant increases in drug overdose deaths in 2015, the last year for which data are available. All six of Fiat Chrysler Automobiles’ U.S. assembly plants, seven of Ford Motor Co.’s eight plants and eight of GM’s 12 plants are in those states. So are three of the four largest auto plants in the country: Nissan’s factory in Smyrna, Tenn.; Toyota’s in Georgetown, Ky.; and Honda’s in Marysville, Ohio. Why is this happening at auto plants? A lot of it has to do with the nature of the work, which is repetitive and often dangerous. Plus, drugs and alcohol at auto plants is nothing new; it’s just that the drugs are probably more devastating than they’ve been in decades. In addition, policies at the plants basically state relapses will cost workers their jobs, so they often don’t seek treatment or tell people. Auto assembly jobs — physically demanding, with workers repeating motions and staying on their feet for long periods — create an environment in which opioid use can easily get out of hand. The story also details how UAW members and automaker employees are trained to keep an eye out for signs of addiction, then provide services that can help, like treatment programs and counseling. But this is a problem that can’t be fixed until it’s addressed at the health care provider level. Again, worth a read in full. The robot cars are coming, and General Motors will show off its autonomous plan to Wall Street investors on Thursday. Being “prepared for the future,” whatever that means and will ultimately look like, is crucial to investors and analysts who have until fairly recently been down on the Big Three’s ability to survive another recession or cataclysmic change to the auto industry. Self-driving and all-electric vehicles are the cornerstones of GM’s goal of “zero crashes, zero emissions and zero congestion,” which Barra announced this year as the automaker’s guiding principles. The event Thursday, Nov. 30, with Wall Street investors is expected to focus on GM’s mobility and self-driving vehicle business, which some analysts have valued as high as $30 billion. It comes two weeks after Barra disclosed GM’s plans for a new fleet of all-electric vehicles that executives expect will increase sales of the alternative powertrains to 1 million annually by 2026 and turn a profit. “We recognize that our industry is changing very quickly, and we plan to participate in the biggest business opportunity since the creation of the Internet,” she said of self-driving cars Nov. 15 at the Barclays Global Automotive Conference. Since purchasing Cruise Automation as its self-driving unit in 2016, GM has been one of the most aggressive automakers in developing and testing autonomous vehicles. [...] Many Hyundai dealers had hoped to add a Genesis franchise, something that is increasingly unlikely given Hyundai’s goals for the Genesis dealer count. They already are permitted to carry the Genesis G80 sedan and more than a third of them had invested in facility improvements and training to qualify to sell the top-of-the-line Genesis G90. The new luxury marque also would give them a chance to earn higher profits. At the same time... have you ever been to a Hyundai dealership? I’d say most of them aren’t yet equipped to have a store that’s aimed at competing with Lexus or BMW or Mercedes. 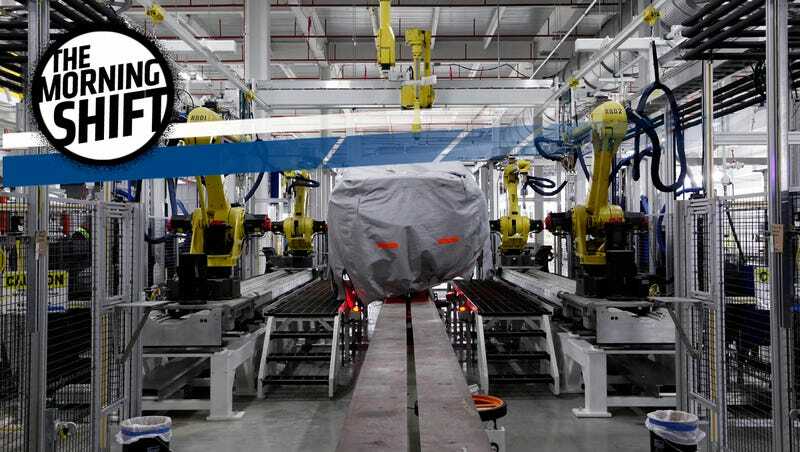 The new test center in Nanjing, China, where Ford already runs a research and engineering center, is the automaker’s first in the world’s largest auto market. The Nanjing Test Center and accompanying MakeSpace creative hub represent $100 million of the company’s roughly $200 million investment in Nanjing. The opening of the test center comes as Ford and other automakers scramble to expand in the rapidly growing Chinese auto market. The Dearborn-based automaker is also partnering with Chinese electric-vehicle giant Anhui Zotye Automobile Co. in a $756 million joint venture to sell all-electric vehicles there. The roughly 160-acre proving ground in Nanjing will allow Ford to more quickly develop cars for the Chinese market. It features 80 different types of road surfaces conditions, a nearly two-mile-long test track and an emissions testing facility. Team Jalopnik will be there to bring you all the news, videos and hot takes. I’m not gonna lie to you, we’re mostly really in town for Radwood 2, but the LA Auto Show will be a good way to pass the time until that happens. Neutral: What Should GM’s Autonomous Car Plan Look Like? How does one of the world’s largest automakers prep for the supposed robot car revolution?